This project has the large task of monitoring and conserving shorebirds along the New South Wales coastline from Wollongong all the way to the Victorian border. Along this coast there are a number of important shorebird sites which are the focus of the project’s activities. Hooded Plovers, Pied Oystercatchers, and Sooty Oystercatchers are spread throughout the area and may be seen at different times in different places. It pays to keep your eyes open aaround any beach, estuary or headland! However, the Little Terns come every year to some estuaries for breeding. Their exact nesting site may vary within the estuary depending on conditions such as whether the estuary is open or closed to the sea and the availability of suitable sandy shoals or dunes. Some of these sites may not be in use in any given year, and in some years all sites are used. A catastrophe such as a storm surge or a raid by foxes may wipe out an entire nesting site and cause the birds to try again at one of the other sites. Check out Season Update page for details of the current season. We are happy for interested persons to Share the Shoreline with the Little Terns in a responsible and non-disturbing manner. Please read our “How You Can Help” page before you venture to one of these sites for some bird watching. It contains information on helpful behaviours around sensitive sites. The following are the major Little Tern breeding sites within our area. 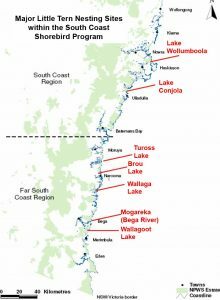 Lake Wollumboola is located south of Culburra Beach, between the Shoalhaven River and Jervis Bay and the Beecroft Peninsula. The Lake, sand bar and south west part of the catchment are included in the Jervis Bay National Park. This important site can have over 50 pairs nesting. Lake Conjola is located north of Ulladulla and Milton, just south of Green Island. The Little Terns usually nest near the entrance to the lake. Some years over 30 pairs will nest here. This land is Crown Reserve under the management of Shoalhaven City Council. Over the summer holidays the area is subject to heavy visitation and beach usage. 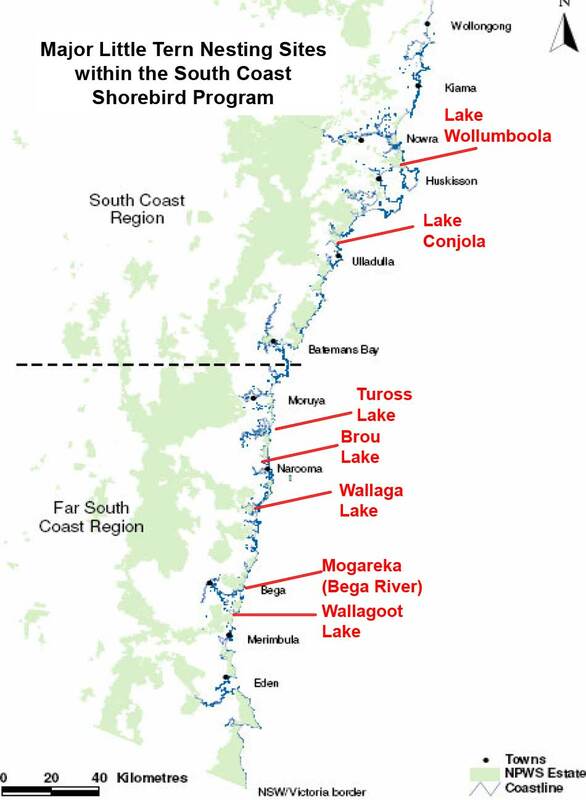 Tuross Lake is roughly midway between Moruya and Narooma. It is a large estuary which can produce a lot of fledglings in a good year. Over 50 pairs nest here, usually on the spit on the southern side of the entrance to the sea, but often on the large sandy shoals just west of the entrance. This area is within Eurobodalla National Park. Brou Lake is just north of Narooma and south of Potato Point. It is a fickle site in terms of some years having quite a few pairs and some years none at all. The nesting sites are often inundated due to the lake being closed for very long periods. this area is also within Eurobodalla National Park. Mogareka, at the entrance of the Bega River just north of Tathra, is another fickle site. The birds can be there in big numbers one year and very few in another. in 2008 over 20 pairs nested. this site is easily accessible by humans, and is just north of the heavily-populated camping and caravan parks in Tathra over the summer holidays. This area is Crown Reserve, managed by Bega Valley Shire Council. Wallagoot Lake is within Bournda National Park and can be busy or not depending on the level of water in the lake. Its famous “Bird Island” west of the entrance can be a tight nesting area with over 20 pairs. If the lake level is not right there will be no birds there at all.